Well it was one crazy roller coaster getting there, but I went to Prague! I can’t think of a better introduction right now, so this is what you’re stuck with, and I guess you’ll have to deal with it. On that note, enjoy! My day started obnoxiously early. 3am, to be exact. Why? Because i was stupid enough to book a flight at 6:45am out of an airport that was an hour away. Ugh. Not my brightest idea, I know. So the night before, when I got back from the show, I asked my hostel to book me a taxi to the airport, and to tell them I can only pay by credit card. They were extremely helpful and set it up for them to arrive at 3:45am. So here is where things get a little ranty, and I apologize for that, but if you are choosing to read my blog, you are going to get my full experience, which was hellish. So I arrive to the airport at about 4:30am, and the taxi driver tell me he doesn’t take credit card. After a whole ordeal, he finally calls his boss who sets up the payment for me over the phone. I get into the airport and find the correct check-in desk. I wait in line for 20 minutes, get to the front, only to find out it is NOT the correct desk, but that it’s around the corner. I angrily storm over to the correct desk, and wait ANOTHER 20 minutes to check in. Thankfully, my bag was underweight, but the woman doesn’t have a visa stamp for my ticket, so she tell me to go wait in yet ANOTHER line. I wait 10 minutes for the stamp and head over to security. The second I walked into the hostel, it was like the horribleness of the morning melted away. Michael, the man at the counter, was so beyond helpful. He even let me check in and go to my room 3 hours before I was supposed to! 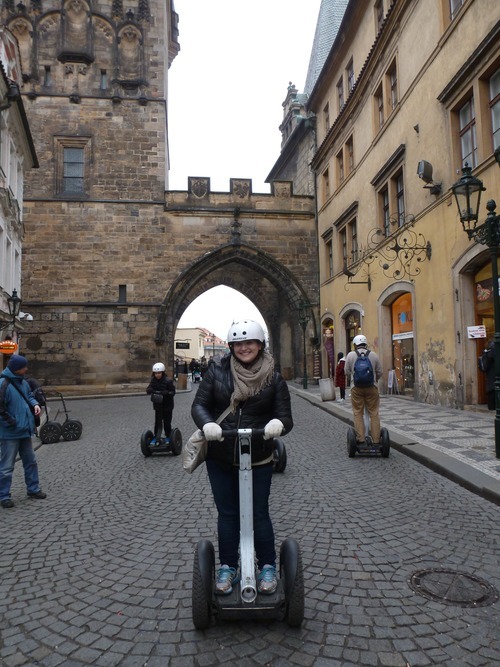 Before I went up to my room, though, I booked a segway tour! Since my hostel is also the information center for the city (I didn’t know this prior to booking), they offer many deals on tours, offering some of them for free! A 3-hour segway tour was being offered for half price at around $30. What a bargain! I thought it would be a great way to see the city, and it didn’t start until 3pm. I was able to take a hot shower and relax in my room for a few hours, getting the bad memory of the morning out of my mind. Thank goodness! When I went back down to the lobby of the hostel to do the segway tour, I see that it would just be me and a father with his 2 children. Seemed fine to me. And then the funniest thing happened: they started speaking in Hebrew! What? I asked them if they were Israeli, and we conversed a bit in Hebrew. Mine had already become a tad rusty after being away for a few weeks. Great. We then set off on the tour with our guide, Honza. Honza was an excellent guide all throughout the tour! He was very passionate and knowledgeable about the city. And he put up with 2 annoying Israeli children who kept wanting to do tricks on their segways. I give him a lot of credit. The only issue was that no matter how hard he tried, he couldn’t remember my name! It was actually pretty funny. Even when I said, “just call me Adi,” he still struggled. Oh well. Below are a few pictures from my tour. Panoramic City View #3. It was absolutely freezing at this point! I had to put on an extra pair of gloves! When I got back to the hostel, I thanked Honza for a great tour and headed out on my next little excursion: a ghost tour! I had done a ghost tour when I was in Edinburgh, Scotland about 2 and ½ years ago, and it was so much fun! Hearing the ghost stories about the city, seeing ancient ruins, etc. I thought it would be cool to try again. And the best part? My hostel offered it for free! So I set out across the Charles Bridge to the Old Town Square to begin the tour. 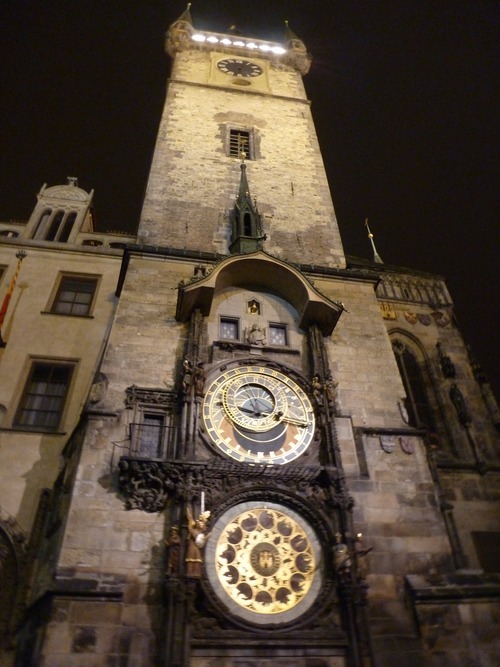 I arrived at the Old Town Square, most famous for the Astronomy Clock. Chinese New Year was just beginning, so the Old Town Square had an ongoing celebration the whole time I was there! It was very cool. When I first walked through, there were some traditional Chinese dancers performing! Really fun to see. When I got to the meeting point, there was a woman dressed in a black cape and a top hat. I figured I was at the right place. I joined the tour and ended up really hitting it off with Sivan, a girl from Haifa! So many Israelis in this city! She was in town to see the Queen concert the night before with a few friends. We had a nice time getting to know each other, but sadly didn’t exchange contact information. The tour itself was okay, nothing too creepy or shocking. Just some old wise tales and stories of people who had seen ghosts. I found the one in Edinburgh much more believable and spooky. Oh well. 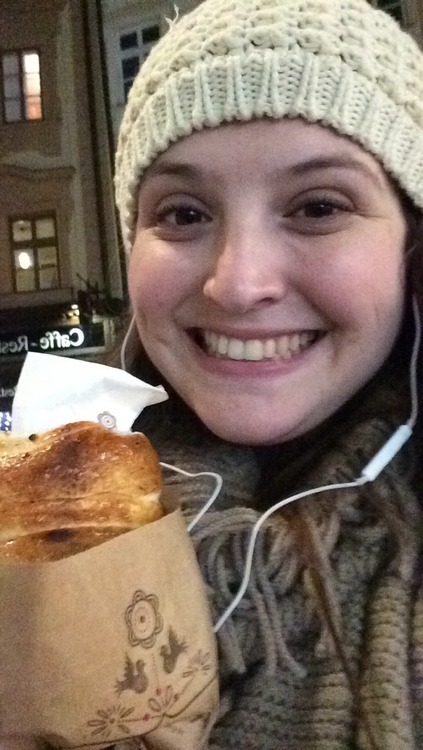 After a long day, I headed back early to the hostel, but not before grabbing the traditional Czech treat, Trdelnik (I have absolutely no idea how to pronounce it, sorry!). It’s a spiral pastry dusted with cinnamon sugar. Absolutely delicious! I gobbled it up and headed for a good night’s rest before my tour the next day! So that was just part 1 of my time in Prague! Sorry for the delay, but wifi was a struggle to come by while traveling throughout Europe. Hoping to catch up as soon as possible, so stay tuned! All of my photos have now been posted, but I may sneak a few different ones into these posts, depending on my mood. Enjoy, and I’ll see you all soon when I’m back in the U.S.!